Multiferroics are materials that exhibit more than one of the fundamental “ferroic” parameters mostly magnetism and electricity at the same time. That might not sound like much, but any material with an in-born ability to hold both magnetic and electrical states should theoretically be capable of translating between the two. In normal materials, controlling a magnetic state requires creating a magnetic field, but in a multiferroic material you’ve got another candidate for input and that can be exploited. New research from the SLAC National Accelerator uses one such material, called terbium manganite, to translate between electronic and magnetic states. They found that doing so allowed them to “switch” their units hundreds of times faster than today’s commercial magnetic storage media. Most existing magnetic storage needs to generate a magnetic field in order to switch a magnetic state but with terbium manganite the same effect can be achieved through the input of electric energy, which can be much easier and faster to control. The magnetic moments of neighboring manganite molecules (blue) shift in one of two directions when excited a version of binary 1s and 0s. As a result, the research found a switch-time of about a picosecond (or a trillionth of a second) as opposed to prior multiferroic speeds on the order of the paltry microsecond. Prior efforts in controlling multiferroic magnetic switches with electric fields have focused simply on turning the field on and off much easier and more efficient than magnetic switching, but not very quick, either. This study used optical lasers tuned to just the right frequency to excite its targets without inducing any appreciable heat. SLAC’s great big Linac Coherent Light Source (LCLS) X-ray laser provided the feedback, watching the switching process progress in real time. The result was that the researchers were able to observe the spin states of electrons in the substance, and watch as they moved toward the opposite conformation with astonishing quickness. Such a switch could be used for data storage, as their material could provide stable maintenance of spin-state after switching. Of course, this is very preliminary. 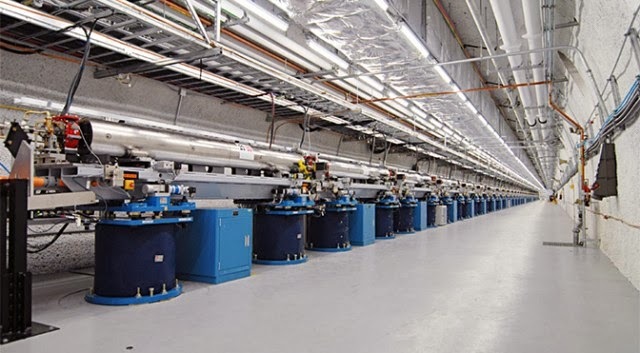 Most damning to the prospects of multiferroic spin-state memory is the sheer size of their experimental apparatus, which cooled the sample with expensive liquid helium and held that sample at the center of a lab-sized laser array. Worse, the LCLS laser used to quantify their progress is even bigger around 1.8 miles (or three kilometers) long, to be precise. 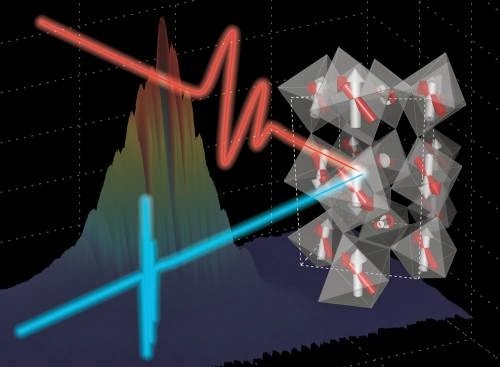 Ultra-quick flashes of the beam were diffracted through the sample of terbium manganite, and diffraction of the pulses over time showed how the magnetic arrangement of molecules changed with the input of optical energy. The red line is the inciting laser, in the optical range, while the blue is the interrogating X-ray laser used to measure the switch speed. The LCLS is the most powerful X-ray electron laser in the world, though perhaps not for long. It was built as an expansion on a previous linear accelerator, and can create pulses so powerful that one of the biggest impediments to research is that the laser tends to obliterate those samples it observes. This is an upshot of the Heisenberg uncertainty principle, that it’s impossible to observe a physical object without also affecting it in some way and this laser can “affect” things very powerfully indeed. Progress in both advanced room-temperature electronics and small-scale light amplification will be necessary to allow this technology to make it to the consumer world and of course, both are already fields of intense modern research. 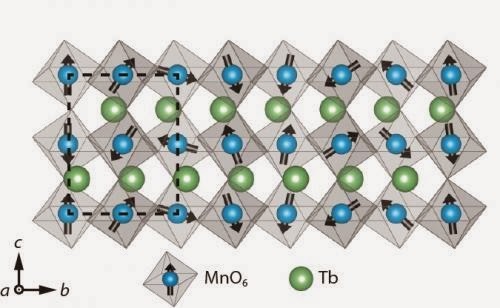 Terbium manganite can only maintain the connection between its magnetic and electrical properties when it is kept extremely cold, but these researchers are already looking for modifications that could allow it to work under conventional cooling. Data storage is due for a quantum leap forward, not just in terms of size, but speed and fidelity as well. Research is progressing quickly in everything from holographic storage, long-term optical discs, and even five-dimensional glass. Much of the research is tending away from magnetic technology, but this study proves the technology might not be down just yet.